Biography/Admin History: The S.S. "Sagona", official number 132682, gross tonnage 808, was built 1912 at Dundee, Scotland by the Dundee Shipbuilding Company, and initially registered in London, England. However the vessel was soon transferred to the St. John's, Newfoundland under joint ownership between the Newfoundland Produce Company, a branch of Crosbie family business managed by John C. Crosbie, and Holmwood and Holmwood of London. 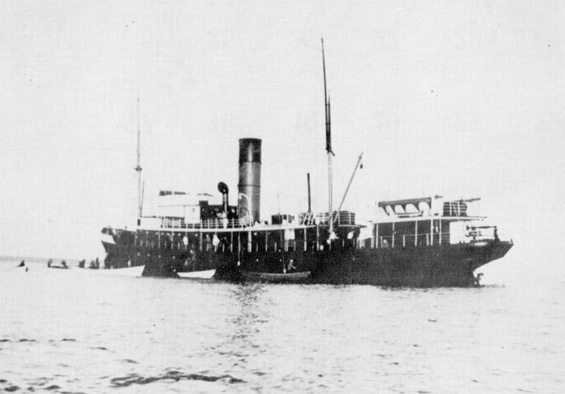 The Reid Newfoundland Company, which operated the Newfoundland Railway and coastal boat service in this period, acquired the vessel by 1915. It was registered to the Newfoundland Government by 1923, part of an arrangement which resulted in the government taking over these services from Reid. Although designed as a passenger vessel with accommodation for 50 saloon and 40 steerage passengers, the vessel's steel hull reinforced by double layers of pitch-pine made it also suitable for operating in ice conditions at the Newfoundland seal hunt. The vessel arrived in St. John's on March 14, 1912 and left for the seal hunt the next day under Captain S.R. Winsor. The vessel was a regular participant in the hunt under a number of captains, including Job Knee, Jack Randell, Lewis Little and Jacob Kean, landing a total of 165,999 seals up to 1938. In the coastal service, the vessel served mainly northern routes. The "Sagona" is perhaps best known for its role in the rescue of survivors from the S.S. "Viking" which exploded near Horse Islands, Labrador on March 15, 1931, having on board a sealing crew of 147 and several passengers, including filmmaker Varrick Frissell. The vessel encountered its own difficulties a couple of weeks later, going aground near the Wadham Islands, Newfoundland on April 4, but was refloated. In 1941 the Newfoundland Government sold the "Sagona" to Colliford Clarke Company of London. Restrictions on Access: Copyright expired. Subjects: Sagona (Ship) / Newfoundland coastal boats / Reid Newfoundland Co.